The CBA held its all-star game in Guangzhou last night, and like in past years, it was kind of a mess. (The festivities took place between the end of the regular season and the beginning of the playoffs, so anyone who took part had either mentally checked out for the year or had much more important basketball on their mind.) These are the "highlights" of the dunk contest, and we're suddenly struck by a new appreciation for Terrence Ross. 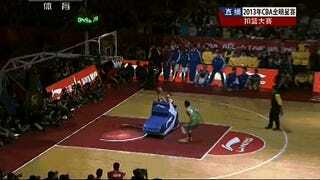 The winner was Zhai Yi, a third-string guard for Shanghai, and even the champion's dunks weren't pretty. The contest was sponsored by shoe company Li-Ning, and for his first dunk, Zhai hoped to slam the ball while sticking a sneaker to the backboard. The shoe stuck, but the ball didn't go in. He eventually put it in on his third attempt, the shoe hovering as a mute witness to his failure. Second place, seen at the top of the post, went to Sen Tiangui for trying (and failing) to dunk over an oversized novelty inflatable rice ball, performed after serving the judges some rice balls. (Happy Chinese New Year!) He would get it on the second attempt, and receive 48 out of a possible 50 points. 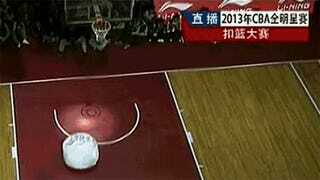 Gao Shang, who tried and failed seven times to complete a boring prop-less dunk, received 30 points anyway and took third. Shark Fin Hoops has your full write-up, if you enjoy sadness.